This section is dedicated to The Tempest, the play by William Shakespeare. The picture is 18th century and image displayed represents the essence of the play which, we hope, will bring to life a famous scene or character from The Tempest. The information provided in this section of william-shakespeare.info includes famous quotes / quotations, summary of the plot or story, facts about the play, a list of the cast and characters and access to the full text - script of The Tempest play by William Shakespeare. King Alonso of Naples and his entourage sail home for Italy after attending his daughter Claribel's wedding in Tunis, Africa. They encounter a violent storm, or Tempest. Everyone jumps overboard and are washed ashore on a strange island inhabited by the magician Prospero who has deliberately conjured up the storm. Prospero is in fact the rightful Duke of Milan who had been put to sea to die with his three-year-old daughter Miranda by his brother, Antonio who was in league with of King Alonso. Prospero and Miranda live in a cave on the island which is also inhabited by Ariel, a sprite who carries out the bidding of Prospero, and the ugly, half human Caliban. Caliban deeply resents Prospero as he believes that he is the rightful ruler of the island. He plots with some of King Alonso's company to murder Prospero. Miranda and Ferdinand fall deeply in love. Ariel rebukes King Alonso for his previous plotting against Prospero. More plots against Prospero are developed but they fail thanks to his magic. The play ends with all offenders repenting, even Caliban. 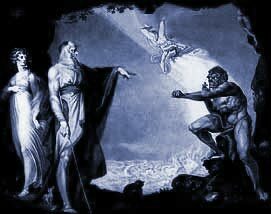 Prospero regains his dukedom, Ariel calms the Tempest and everyone, except Caliban, leaves the island. Themes discussed in the Tempest are freedom, friendship , repentance and forgiveness. The first recorded production of The Tempest was performed on November 1 1611. In the Elizabethan era there was a huge demand for new entertainment and The Tempest would have been produced immediately following the completion of the play. It is believed that The Tempest was first printed in 1623 in the First Folio. As William Shakespeare clearly did not want his work published details of the play would have therefore been noted, and often pirated without his consent, following a performance. The settings for The Tempest are a ship at sea and an unnamed, uninhabited island. Miranda, Prospero, Alonso, Ariel and Caliban. The quotes from the play are amongst Shakespeare's most famous including 'We are such stuff as dreams are made on' . Details of this famous quote follow with others, complete with information regarding the Act and the Scene, allowing a quick reference to the section of the play that these quotations can be found in. Please click here for the full text of the script of the play.
" . (Act II, Scene II). The Tempest was not based on any real characters. It is believed that the island Shakespeare had in mind was the Bermudas when writing the Tempest. Shakespeare probably based The Tempest on Montaigne's essay "Of Cannibals". It is interesting to note that Caliban is almost an anagram for cannibal. The account of the wreck of the Sea Venture in the Bermudas in 1609 was also a probable source of information. The Tempest has inspired other works such as the films starring John Cassavetes and Gena Rowlands. Another famous production stars Peter Fonda. The acclaimed Sci-Fi film production of The Forbidden Planet is also based on The Tempest. The classic sci-fi film Forbidden Planet was also based on the play.